Quilting and Life in General: EUREKA!!!! 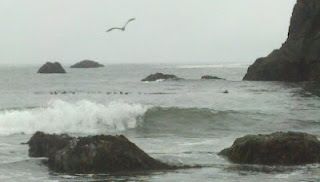 This morning was all grey and misty and we almost decided not to walk the beach. But there were dozens of pelicans fishing our bay. Some were really close so we headed down to see them close-up-and-personal! With the phone camera delay - very frustrating to try to catch them diving!! You have to click the camera when the bird 'looks' like it's going to dive!!! Beyond me! 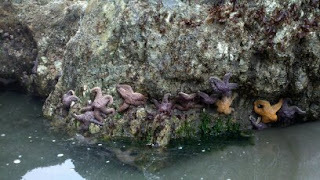 So we just enjoyed them for awhile and then headed off down the beach to see what else we could see. 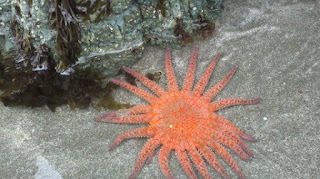 There was a great sunburst star fish. There were loads of regular star fish. 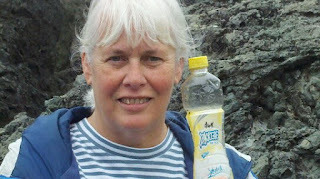 An Iced Tea bottle - Japanese label and 2011 date on the lid!! There's ocean 'things' growing on it. Could be from the tsunami - we'll never know for sure ... but so exciting to find!! Guess we'll be walking the beach, whether it's grey and misty or sunny!!! What fun! Use it up ... make it do ... feel triumphant!! Baby Quilt on it's way!! Whoo-hoo!